Are words I often hear from clients about things they’ve said or done that may have caused hurt or about things they think they’ve done (or not done), like failing to be a good parent or partner. 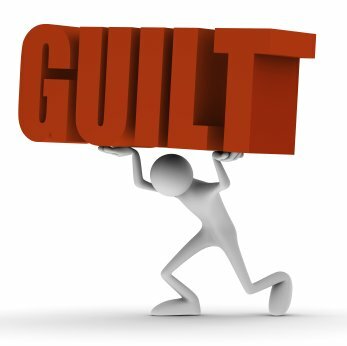 What is guilt and what does it do? To some, guilt may feel like shame or embarrassment. To others, it may feel like a heavy weight. If you imagine the effort it takes to hold an inflated beach ball under water, that’s what holding on to guilt can feel like. The effects too (such as low self-esteem, distancing from others, tiredness, anxiety) can be difficult to deal with. Guilt is generally the result of a clash between an image we have of ourselves and something we’ve done that doesn’t match that image. If you have an image of yourself as a “good” person for instance and you have done something you consider as “bad”, you are likely to judge yourself as guilty. So what’s the point of guilt and what can be done about it? Obviously you can’t change the action if it’s in the past. You can however try to make amends. Saying sorry (and meaning it! ), taking (and admitting) responsibility for what you’ve done and (if possible) taking action to correct the mistake are all important steps towards alleviating guilt. Whether or not you are able to take corrective action, rather than berating yourself for the past, what can you learn from what you did? How can you use your mistake as an opportunity for growth and change? How can you make sure you don’t repeat it? Getting to know when you are listening to your critical inner voice, rather than your values, is an important step towards releasing guilt. Is what the critical voice saying 100% true? Really? What’s another possibility? Values make up who we are and are like a compass – guiding us to do what’s right for us, if we listen to them. Take some time to think about and list your values. When they are honoured, the critical inner voice of self-judgement goes quiet. Often self-judgement occurs because we have not measured up to that image of how we “should” be. Consider how high your standards are – are you aiming for perfection? A rule of thumb “Don’t should on yourself”! What if you were to create a new, perhaps more realistic image of yourself being the best you can be, rather than perfect? One of the antidotes to self-judgement and guilt is forgiveness. Step back and look at the action ie separate yourself from it. You are not the action. (This is not to say you’re not responsible for it and it’s not to say the action was ok though). Doing something you later regret doesn’t make you a bad person. Can you forgive yourself, even if you can’t forgive the action? What would you say to a young child if they had made the same mistake? Speak to yourself with as much compassion and care as you would a young child. Separating the person from the action in your mind is also a good exercise if you are struggling to forgive someone else. Sometimes we feel guilty for what we think we’ve done. I coached a man who was feeling guilty for being a “bad father” because in his children’s formative years his work had taken him away a lot. When he asked his children about it, they assured him that to them, he had been an amazing father. It’s really helpful to become aware of our beliefs and assumptions. Challenging them and checking them may change how you see a situation and yourself, because often they are not 100% true. Revisiting the past in your mind with regret and guilt won’t change it and is unlikely to change how you feel. When you’ve done what you can to correct your mistakes and make amends, taking the additional steps above will go a long way towards reducing your guilt and ensuring you don’t repeat the past in the future.